Place a call. If the person you’re calling is one of your favorites, press the side button, turn the Digital Crown or tap their initials, then tap the Call button. If they’re not in your friends list, open the Phone app , then tap Favorites or Contacts. Turn the Digital Crown to scroll, then tap the name you want to call. See call info on Apple Watch. 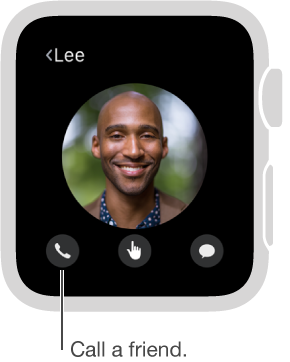 While you’re talking on iPhone, you can view call information on Apple Watch in the Phone app . You can also end the call from Apple Watch (for example, if you’re using earphones or a headset).